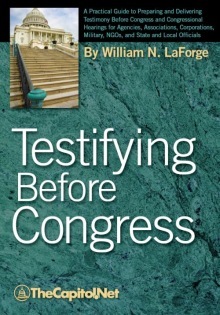 The Training Edition of Testifying Before Congress is included as part of the program materials in our public and custom Testifying Before Congressional Committees training programs. TheCapitol.Net has delivered custom, on-site testifying training for numerous clients. For more information about bringing this training to your organization, contact us for details: 202-678-1600, ext. 112. Arguments Before The Committees On Patents of the Senate and House of Representatives, Conjointly, On The Bills S. 6330 and H.R. 19853. To Amend and Consolidate the Acts Respecting Copyright. Mr. CLEMENS. I have read the bill. At least I have read such portions of it as I could understand; and indeed I think no one but a practiced legislator can read the bill and thoroughly understand it, and I am not a practiced legislator. I have had no practice at all in unraveling confused propositions or bills. Not that this is more confused than any other bill. I suppose they are all confused. It is natural that they should be, in a legal paper of that kind, as I understand it. Nobody can understand a legal paper, merely on account of the language that is in it. It is on account of the language that is in it that no one can understand it except an expert. Necessarily I am interested particularly and especially in the part of the bill which concerns my trade. I like that bill, and I like that extension from the present limit of copyright life of forty-two years to the author's life and fifty years after. I think that will satisfy any reasonable author, because it will take care of his children. Let the grandchildren take care of themselves. "Sufficient unto the day." That would satisfy me very well. That would take care of my daughters, and after that I am not particular. I shall then long have been out of this struggle and independent of it. Indeed. I like the whole bill. It is not objectionable to me. Like all the trades and occupations of the United States, ours is represented and protected in that bill. I like it. I want them to be represented and protected and encouraged. They are all worthy, all important, and if we can take them under our wing by copyright, I would like to see it done. I should like to have you encourage oyster culture and anything else. I have no illiberal feeling toward the bill. I like it. I think it is just. I think it is righteous, and I hope it will pass without reduction or amendment of any kind. I understand. I am aware, that copyright must have a term, must have a limit, because that is required by the Constitution of the United States, which sets aside the earlier constitution, which we call the Decalogue. The Decalogue says that you shall not take away from any man his property. I do not like to use the harsher term, "Thou shalt not steal." But the laws of England and America do take away property from the owner. They select out the people who create the literature of the land. Always talk handsomely about the literature of the land. Always say what a fine, a great monumental thing a great literature is. In the midst of their enthusiasm they turn around and do what they can to crush it, discourage it, and put it out of existence. I know that we must have that limit. But forty-two years is too much of a limit. I do not know why there should be a limit at all. I am quite unable to guess why there should be a limit to the possession of the product of a man's labor. There is no limit to real estate. As Doctor Hale has just suggested, you might just as well, after you had discovered a coal mine and worked it twenty-eight years, have the Government step in and take it away--under what pretext! generously gives it to the eighty-eight millions. That is the idea. If it did that, that would be one thing. But it does not do anything of the kind. It merely takes the author's property, merely takes from his children the bread and profit of that book, and gives the publisher double profit. The publisher and some of his confederates who are in the conspiracy rear families in affluence, and they continue the enjoyment of these ill-gotten gains generation after generation. They live forever, the publishers do. As I say, this limit is quite satisfactory to me--for the author's life, and fifty years after. In a few weeks, or months, or years I shall be out of it. I hope to get a monument. I hope I shall not be entirely forgotten. I shall subscribe to the monument myself. But I shall not be caring what happens if then is fifty years' life of my copyright. My copyrights produce to me annually a good deal more money than I have any use for. But those children of mine have use for that. I can take care of myself as long as I live. I know half a dozen trades, and I can invent a half a dozen more. I can get along. But I like the fifty years' extension, because that benefits my two daughter, who are not as competent to earn a living as I am, because I have carefully raised them as young ladies, who don't know anything and can't do anything. So I hope Congress will extend to them that charity which they have failed to get from me. Why, if a man who is mad--not mad, but merely strenuous--about race suicide should come to me and try to get me to use my large political or ecclesiastical influence for the passage of a bill by this Congress limiting families to 22 children by one mother, I should try to calm him down. I should reason with him. I should say to him, "That is the very parallel to the copyright limitation by statute. Leave it alone. Leave it alone and it will take care of itself." There is only one couple in the United States that can reach that limit. Now, if they reach that limit let them go on. Make the limit a thousand years. Let them have all the liberty they want. You are not going to hurt anybody in that way. Don't cripple that family and restrict it to 33 children. In doing so you are merely offering this opportunity for activity to one family per year in a nation of eighty millions. It is not worth the while at all. The very same with copyright. One author per year produces a book which can outlive the forty-two year limit, and that is all. This nation can not produce two authors per year who can create a book that will outlast forty-two years. The thing is demonstrably impossible. It can not be done. To limit copyright is to take the bread out of the mouths of the children of that one author per year, decade, century in and century out. That is all you get out of limiting copyright. minds the number of men in the nineteenth century who wrote books in America which books lived forty-two years you will begin with Fennimore Cooper, follow that with Washington Irving, Harriet Beecher Stowe, and Edgar A. Poe, and you will not go far until you begin to find that the list is limited. You come to Whittier and Holmes and Emerson, and you find Howells and Thomas Bailey Aldrich, and then the list gets pretty thin and you question if you can find 20 persons in the United States in a whole century who have produced books that could outlive or did outlive the forty-two year limit. You can take all the authors in the United States Whose books have outlived the forty-two year limit and you can seat them on one bench there. Allow three children to each of them, and you certainly can put the result down at 100 persons. Add two or three more benches. You have plenty of room left. That is the limit of the insignificant number whose bread and butter are to be taken away. For what purpose? For what profit to anybody? Nobody can tell what that profit is. It is only those books that will outlast the forty-two-year limit that have any value after ten or fifteen years. The rest are all dead. Then you turn those few books into the hands of the pirate--into the hands of the legitimate publisher--and they go on, and they get the profit that properly should have gone to wife and children. I do not think that is quite right. I told you what the idea was in this country for a limited copyright. The English idea of copyright, as I found, was different, when I was before the committee of the House of Lords, composed of seven members I should say. The spokesman was a very able man, Lord Thring, a man of great reputation, but he didn't know anything about copyright and publishing. Naturally be didn't, because he hadn't been brought up to this trade. It is only people who have had intimate personal experience with the triumphs and griefs of an occupation who know how to treat it and get what is justly due. Now that gentleman had no purpose or desire in the world to rob anybody or anything, but this was the proposition--fifty years extension--and he asked me what I thought the limit of copyright ought to be. "Well," I said, "perpetuity." I thought it ought to last forever. Well, he didn't like that idea very much. I could see some resentment in his manner, and be went on to say that the idea of a perpetual copyright was illogical, and so forth, and so on. And here was his reason--for the reason that it has long ago been decided that ideas are not property, that there can be no such thing as property in ideas. I said there was property in ideas before Queen Anne's time, that it was recognized that books had perpetual copyright then. Doctor Hale has explained why they reduced it to forty-two years in Queen Anne's time. That is a very charitable explanation of that event. I never heard it before. I thought a lot of publishers had got together and got it reduced. But I accept Doctor Hale's more charitable view, for his information is more than mine and he is older than I am, but not much older. He is older, but not much older. That there could be no such thing as property in an intangible idea. He said, "What is a book? A book is just built from base to roof with ideas, and there can be no property in them." I said I wished he could mention any kind of property existing property that had a pecuniary value, which was not derived from an idea or ideas. "Well," he said, "landed estate--real estate." "Why," I said, "Take an assumed case, of a dozen Englishmen, traveling through the South-Africa--they camp out; eleven of them see nothing at all; they are mentally blind. But there is one in the party who knows what that harbor means, what this lay of the land means; to him it means that some day--you can not tell when--a railway will come through here, and there on that harbor a great city will spring up. That is his idea. And he has another idea, which is to get a trade, and so, perhaps, he sacrifices his last bottle of Scotch whisky, and gives a horse blanket to the principal chief of that region and buys a piece of land the size of Pennsylvania. There is the value of an idea applied to real estate. That day will come, as it was to come when the Cape-to-Cairo Railway should pierce Africa and cities should be built, though there was some smart person who bought the land from the chief and received his everlasting gratitude, just as was the case with William Penn, who bought for $40 worth of stuff the area of Pennsylvania. He did a righteous thing. We have to be enthusiastic over it, because that was a thing that never happened before probably. There was the application of an idea to real estate. Every improvement that is put upon real estate is the result of an idea in somebody's head. A skyscraper is another idea. The railway was another idea. The telephone and all those things are merely symbols which represent ideas. The washtub was the result of an idea. The thing hadn't existed before. There is no property on this earth that does not derive pecuniary value from ideas and association of ideas applied and applied and applied again and again and again, as in the case of the steam engine. You have several hundred people contributing their ideas to the improvement and the final perfection of that great thing, whatever it is--telephone. telegraph, and all." So if I could have convinced that gentleman that a book which does consist solely of ideas, from the base to the summit, then that would have been the best argument in the world that it is property, like any other property, and should not be put under the ban of any restriction, but that it should be the property of that man and his heirs forever and ever, just as a butcher shop would be, or--I don't care--anything, I don't care what it is. It all has the same basis. The law should recognize the right of perpetuity in this and every other kind of property. But for this property 1 do not ask that at all. Fifty years from now I shall not be here. I am sorry, but I shall not be here. Still, I should like to see it. which reduced it to forty years--a speech that was read all over the world by everybody who does not know that Lord Macaulay did not know what he was talking about. So he inflicted this disaster upon his successors in the authorship of books. It has to undergo regular and slow development--evolution. Here is this bill, one instance of it. Make the limit the author's life and fifty yean after, and, as I say, fifty years from now they will see that that has not convulsed the world at all. It has not destroyed any San Francisco. No earthquakes concealed in it anywhere. It has changed nobody. It has merely fed some starving author's children. Mrs. Stowe's two daughters were close neighbors of mine, and--well, they had their living very much limited. That is, to my mind, about what I was to talk about. I have some notes--I don't know in which pocket I put them--and probably I can't read them when I find them. There was another thing that came up in that committee meeting. I would rather get the advantage of a lord than most anyone. He asked me on what ground I could bring forth such a sort of monstrosity as that--the idea of a perpetual copyright on literature. He said, "England does not do that." That was good argument. If England doesn't do a thing, that is all right. Why should anybody else? England doesn't do it. England stands for limited copyright, and will stand for limited copyright, and not give unlimited copyright to anybody's books. I said, "You are excepting one book." He said, "No; there is no book in England that has perpetual copyright." I said, "Yes; there is one book in England that has perpetual copyright and that is the Bible." He said, "There is no such copyright on the Bible in England." But I had the documents with me, and I was able to convince him that not only does England confer perpetual copyright upon the Old and New Testaments, but also on the Revised Scriptures, and also on four or five other theological books, and confers those perpetual copyrights and the profits that may accrue not upon some poor author and his children, but upon the rich and competent, who can take care of themselves without perpetual copyright. There was that one instance of injustice, the discrimination between the author of the present day and the author of thousands of years ago, whose copyright had really expired by the statute of limitations. neighborhood be made a jump and he climbed up on the portico. The house went an weaving. He watched his door, and when it came around his way he climbed through it. He got to the stairs, went up on all fours. The house was so unsteady he could hardly make his way, but at last he got up and put his foot down on the top stop, but his toe hitched on that step, and of course be crumpled all down and rolled all the way down the stairs and fetched up at the bottom with his arm around the newel post, and he said, "God pity a poor sailor out at sea on a night like this." The committee adjourned until 10 o'clock a. m. to-morrow.